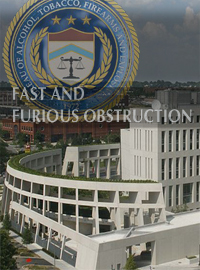 Emails among the principal contributors to a February 4, 2011, letter sent to Congress about the federal government’s involvement in the Fast and Furious 'gun walking' scandal reveal a culture of obstruction rampant in the upper echelons of Holder’s Justice Department. The best reason to tell the truth is that it’s too hard to remember the lies. When the U.S. Department of Justice released over 1,000 pages of internal documents last Friday evening, a charge that seemed unlikely to be proven just weeks before appears now all but certain to apply to Attorney General Eric Holder and his top lieutenants: guilty of obstruction of justice. Emails among the principal contributors to a February 4, 2011, letter sent to Congress about the federal government’s involvement in the Fast and Furious “gun walking” scandal reveal a culture of obstruction rampant in the upper echelons of Holder’s Justice Department. Jason Weinstein, a successful prosecutor appointed to a political position in the DOJ’s Criminal Division, pushed hard for a letter that “categorically” denied the allegations from Senator Chuck Grassley (R-IA) that the federal government had facilitated the sale of guns to Mexican drug cartels. With evidence mounting that the Bureau for Alcohol, Tobacco, Firearms and Explosives (ATF) did indeed arm drug gangs before losing track of the guns, both Burke (since resigned) and Weinstein have blamed their overzealous responses to misinformation from underlings. Unsurprisingly, so has Lanny Breuer, Weinstein’s boss as head of the Criminal Division. Not to be outdone, Holder, whom Breuer reports to directly, is also pleading ignorance based on bad information from subordinates. One wonders when the unpaid law school intern responsible for the shipment of 2,000 assault weapons to military-style drug syndicates will call a press conference to take responsibility for one of the greatest scandals in American history. The problem for all of these highly placed lawyers at Justice is that logic doesn’t support their stories. Burke was the top federal prosecutor in Arizona at the time Fast and Furious was in operation. All it would have taken for him to get his facts straight was to call his counterpart at ATF. Even if the ATF peer lied, Burke would be in the clear. Instead, he’s out of a job and in line for some tough questions about his ability to be a competent manager. Weinstein’s job as the top deputy at the Criminal Division was to investigate the truth of inquiries like the one Grassley’s office submitted to Justice. If his first (and apparently only) reaction to a request for information is to treat it like an opportunity to play political hardball rather than share information, he’s demonstrably unfit for his job. As for Holder, his mistake was to lie under oath at a May 3, 2011, hearing before Rep. Darrell Issa (R-CA) and the House Committee on Government Reform and Oversight about when he first heard about Fast and Furious. At the time, he said it was in January 2011. Documents disclosed soon thereafter showed he received at least two briefings on the operation as early as June 2010. Holder has since tried to minimize his perjury by claiming that he “didn’t recall” reading or hearing the briefing. Before, during and after his now infamous testimony, Holder refused to answer inquiries from Grassley and Issa, heavily redacted information he did share and treated any questions about his handling of the situation with finger-wagging resentment. Last week he green-lighted sealing all evidence, filings and statements related to the trial of the murderer of Border Patrol Agent Brian Terry. For Eric Holder, this kind of obstruction is the behavior he models for his subordinates. It’s no wonder they took the hint and tried to derail a lawful congressional investigation. Holder’s Justice Department is in total spin control mode, sputtering out phrases like “do not recall,” “misunderstood,” “mistaken” and “inaccurate” to explain away how multiple levels of highly skilled attorneys failed to ask questions, press for answers and insist on the honesty and accuracy of all involved, no matter their positions..
It’s been nearly a year (December 14, 2010) since Border Patrol Agent Brian Terry was murdered near the U.S.-Mexico border by a cartel member armed with a Fast and Furious rifle. It’s obvious that a corrupt process has impeded the investigation into the circumstances that allowed Terry’s death. That the author of that process is the sitting United States Attorney General does not absolve him of being prosecuted for obstructing the justice due both to the public and Brian Terry’s family.